The Davidson family has its roots in the tiny village of Aberlemno near the small market town of Brechin in northeast Scotland. Alexander (Sandy) Davidson was the wright at Netherton Smiddy (blacksmith’s shop), where he lived in the two-bedroom smiddy cottage with his wife, Margaret, their six children and two workers. It was from this picturesque cottage, nestled in the beautiful rolling Scottish countryside that Sandy and Margaret travelled to their new life in Wisconsin, USA. There, one of their sons, William C, met and married another Scot, Margaret McFarlane, from Stirlingshire. Three of their children, Arthur, Walter and William, along with Englishman Bill Harley, became the founders of the Harley-Davidson Motor Company®. 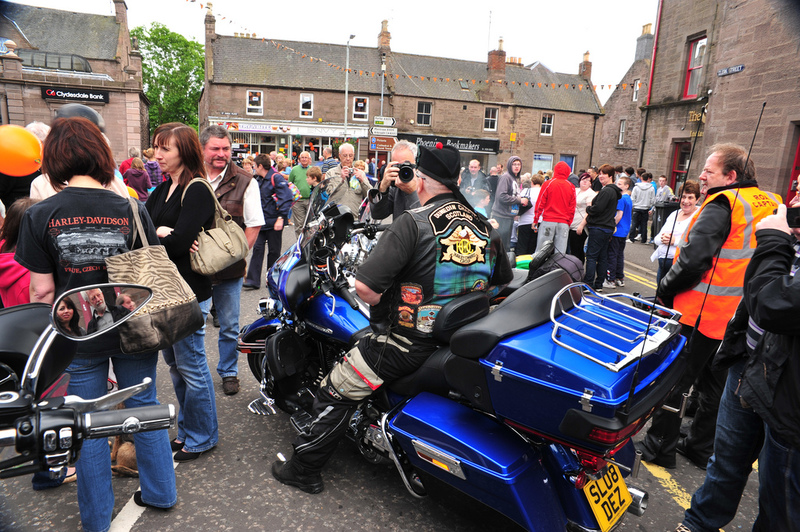 The Davidson family hasn’t been forgotten in Scotland and local people are proud that the area is home to the founding fathers of the Harley-Davidson Motor Company®. 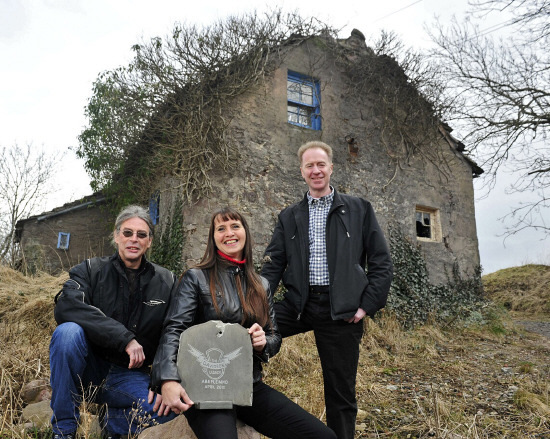 In 2008 three Harley-Davidson® enthusiasts, Mike Sinclair, Maggie Sherrit and Keith Mackintosh, found the cottage, by then a crumbling ruin. This happened just in time! The property was on the market and was earmarked for demolition to make way for a new housing development. Luckily, those three decided not to let that happen. They bought the cottage and set up the Davidson Legacy to save the site as a tribute to the pioneering Davidsons. For four years the Davidson Legacy team worked tirelessly to restore the little house to how it would have looked when Sandy and Margaret left it in 1858 to make the gruelling trip to America. This was no mean feat! The local planning department had already allowed the demolition and development of the neighbouring smiddy and seemed not to understand the concept and importance of preserving the historic building so the project started with an eighteen-month battle through red tape. Then there was the problem of funding the restoration. The three had sunk every available penny into the purchase of the property so they set out to find finance for their project. 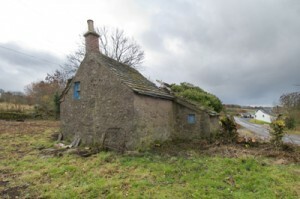 Happily, the Scottish Government and the local tourism partnership were more understanding than the planners and provided enough funding for the work to commence. 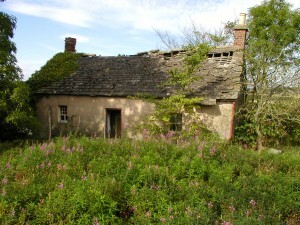 During the long planning battle the cottage had fallen further into disrepair. The whole roof had fallen in, an end gable had developed a huge crack, and the famed Scottish weather had begun to take its toll. Undaunted, the Davidson Legacy team, led by Mike with his vision for the cottage’s future, began the enormous task of restoring the cottage to its former glory. Local bikers joined in to help clear the ground of almost a decade of neglect and, as the building began to emerge from the undergrowth, the enormity of the task became evident. Thistles, nettles, brambles and willowherb were chopped down to reveal four walls, one of them badly damaged by ivy, and a house piled high with the remains of the roof slates amongst the ruined belongings of the house’s last resident. The team had big plans though. Mike’s vision was of the faithful restoration of the 19th century dwelling using authentic materials, traditional methods and local tradesmen. Maggie wanted to create a “living” experience where people could come to learn how life was for the Davidson family in 19th century Scotland. And, for the whole team, it was important that local people and Harley-Davidson® enthusiasts should feel ownership and benefit from this very special site. Meanwhile, the word had started to spread and, even in its derelict state, visitors were arriving from as far afield as the USA, Australia, France, Italy, Spain and Switzerland to stand in the place where the legend began and enjoy its special history and atmosphere. 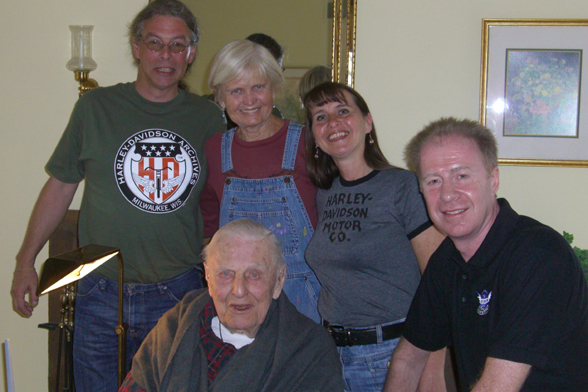 Mike, Maggie and Keith had followed the Davidson family’s example and travelled to Milwaukee to meet some of the family and visit the Harley-Davidson® museum. The Clan Davidson had discovered the cottage and got behind the project with enthusiasm. At last things were starting to look up and, increasingly, help and support were forthcoming. 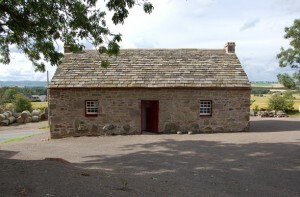 With the planning issues almost sorted out and funding in place, it took only one year to complete the restoration of the cottage to its 19th century state. Today, it stands restored and fully furnished as the home that the Davidson family would recognise if ever they returned. In the kitchen, the old range is up and working, ready to cook broth and oatcakes to feed a hungry family. The old box bed in the corner is ready to sleep in. From the upstairs bedrooms, reached by a tiny enclosed wooden staircase, the traditional small wooden windows provide panoramic views across the surrounding fields and the Strathmore (Big Valley) to the mountains beyond. In the cosy parlour, a picture of Sandy and Margaret, photographed in 1857, takes pride of place, and it seems that they watch the modern-day comings and goings in the cottage, perhaps with a little amusement. The cottage was officially opened on July 14th, 2012 and the tiny village of Aberlemno had never seen such excitement as two hundred Harley-Davidsons® rumbled in to celebrate the completion of the cottage restoration. In Aberlemno, and the neighbouring town of Brechin, local people turned out in force to welcome the bikers and to show their pride in their famous sons. Local schoolchildren showed off their own Harley-Davidson® gas tank designs to the bikers’ delight, and, in the lovely old church at Aberlemno, a special service was held to remember and celebrate the family’s strong Presbyterian roots. 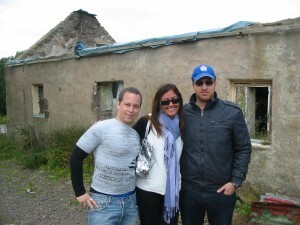 People travelled from as far afield as Milwaukee, Canada, Holland and Spain to join the party and see the famous little house. 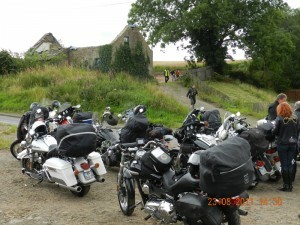 Netherton Cottage (now known as The Davidson Cottage), has become a pilgrimage site for Harley-Davidson® enthusiasts from across Europe, America and even Australia. Everyone is afforded the warm Scottish welcome that the Davidsons would certainly have extended to visitors to their humble little dwelling. Shortly after the opening, Arthur Davidson’s great granddaughter, Heather, and her new husband, on honeymoon in Scotland visited the cottage and saw the place where her great great grandfather was born. What a home-coming! The cottage is available now for people to stay the weekend and experience life as it would have been for Sandy, Margaret and their children. 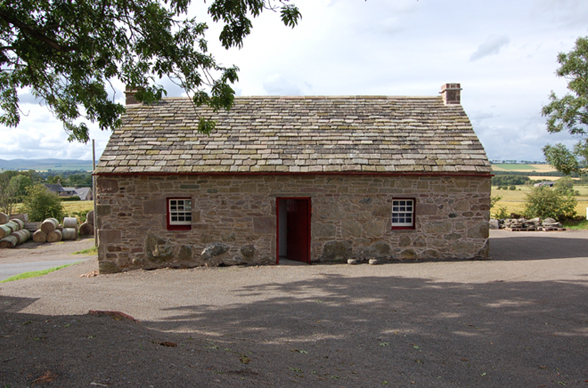 Visitors can learn about 19th century Scotland and find out, first-hand, about the hard, but also peaceful life that the Davidsons enjoyed in rural Scotland. The restoration of The Davidson Cottage was a big undertaking and an arduous task but, in the end, it was all worth it. Maybe it reflects the long, difficult journey that Sandy and Margaret made with their children, including little William C, who went on to become father to the founders of the world’s best known motorcycles. Just think, if they hadn’t been brave enough to make that tough journey, the Harley-Davidson® motorcycle might never have happened.